Summer is practically upon us and it's been pretty hot down here in the South. That means it's going to start getting HOT outside soon. As a dog parent, it's important to keep your pet safe during the hot summer months. You've got to keep them cool in shaded areas or in air conditioning, you can't leave them in hot cars while you go into the store, provide them with plenty of fresh drinking water, and protect their skin from the sun's rays. It's also important to protect your dog's feet from scorching hot concrete. It's something not every dog parent may think of at first, until their dog's paws get burned from walking on hot concrete or other surfaces. Many years ago when I was still a young dog mom, we took Shiner to the lake on several occasions. She would run along the shore's limestone rocks all day long. By the end of the day, her feet would be very tender and beat up. I'm sure the rocks were pretty hot. Not to mention rough on her footsies. So in preparation for Summertime, I'm sharing 4 ways to protect your dog's paws from hot concrete. The most obvious and easiest way to avoid burnt paw pads is by avoiding hot surfaces all together. Try walking in a grassy area or somewhere that's shady. You can also try walking on these surfaces when it's cooler outside, like in the morning or evening. If you must walk your dog on a hot surface, you should limit the amount of time spent there. And if you have a small dog, you can always pick them up and carry them across a parking lot if you need to. If you can't avoid the hot concrete completely, you might want to look into purchasing a pair of dog boots. There are many different brands of dog boots all with different features available. Shiner recently tried out a pair of Pawz Dog Boots for the first time and we really like them. I'm ordering new ones soon as we picked out the wrong size the first time and they were too small. 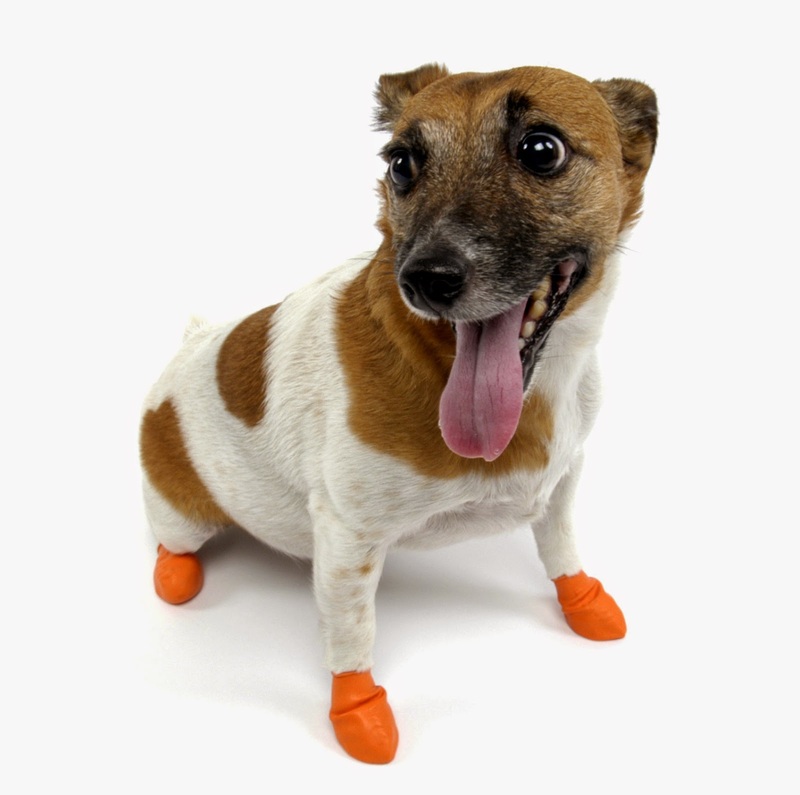 The Pawz Dog Boots are reusable, waterproof, and will protect your dog's paw pads from getting burnt on hot surfaces during the Summer. Using a dog stroller may not be applicable in all situations. I know those dog parents who have large dogs can't use a stroller. They are mostly for small breed dogs. Of course, your dog will still need to be walked for exercise too but you can try to do that during the cool hours of the day. 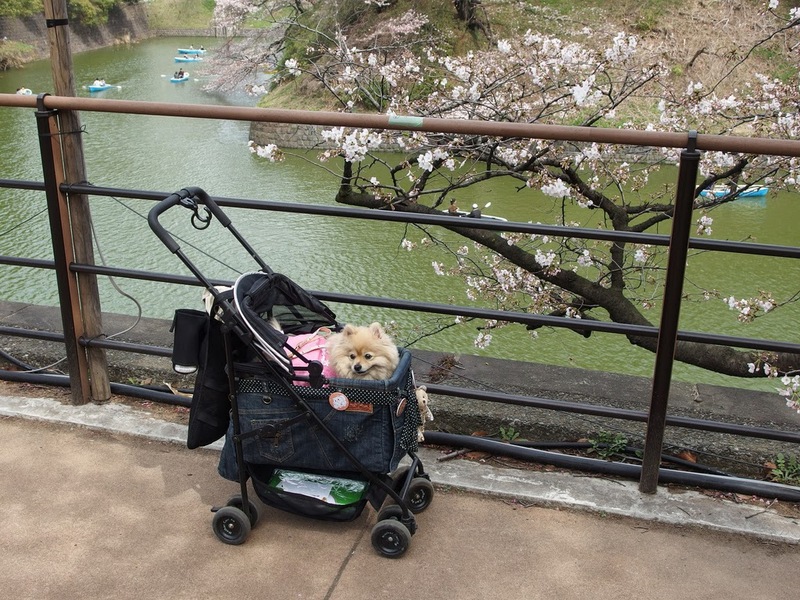 A dog stroller could come in handy if you're taking your dog to an outdoor pet friendly event for an extended period of time where hot ground surfaces are present. If your dog's paw pads do become burnt from walking across hot pavement, you should of course check with your veterinarian to make sure everything is OK. There are also some paw creams and ointments that I've used before which I think could be helpful and soothing for your pet. 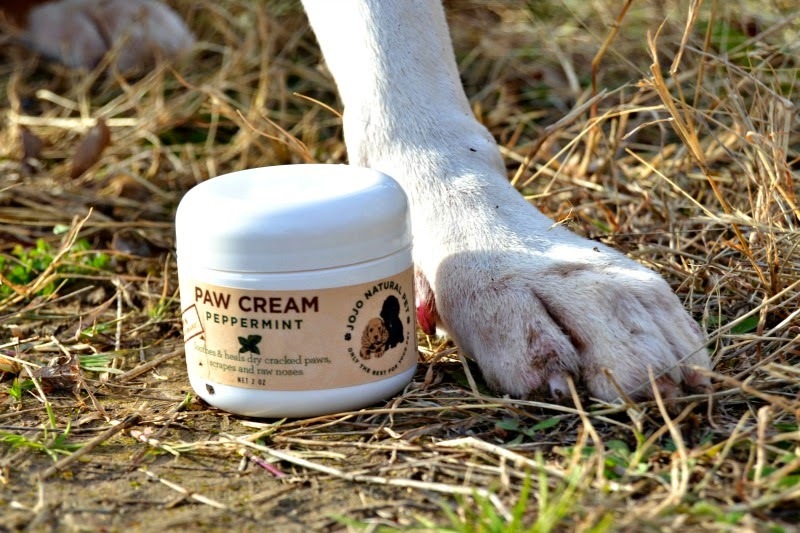 I've used JoJo Natural Pet Peppermint Paw Cream on Shiner's feet before. I also used the stuff on myself, but that's another story. It smells great, feels great, and it's 100% organic and natural. 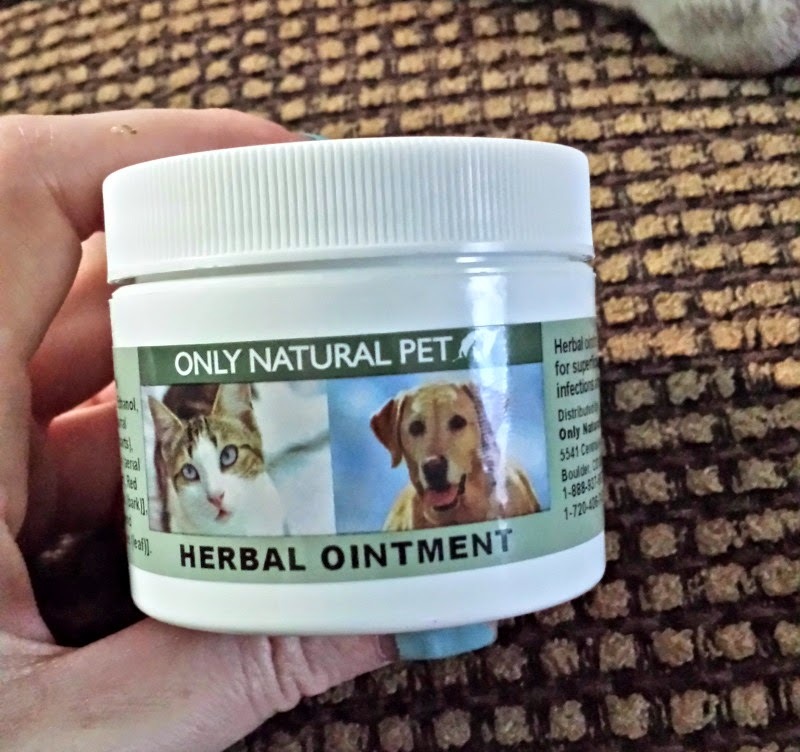 Another great product for your dog's paw pads is Only Natural Pet's Herbal Ointment. We are currently using this on Shiner's paw pads for other reasons. It has a wide variety of uses for many different skin problems. So remember to stay safe this summer and keep those doggy paw pads from getting burned! I don't know about you, but I wouldn't want to walk around with burnt footsies. 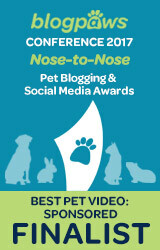 You can help spread the message by sharing with your dog parent friends! This post contains affiliate links. If you make a purchase using one of these links, Pawsitively Pets makes a small commission. We had that only once when we had a really hot Summer and Ancient Pip who was young then had burnt paws and we had to go to the vets. Not so easy avoiding a pavement in town but thanks for the tips as we are supposed to have a hot one this Summer. Have a tremendous Thursday. Yea I can see how it would be hard to do for those peeps who live in an urban setting for sure. Great info! Paws shouldn't have to hurt like that. 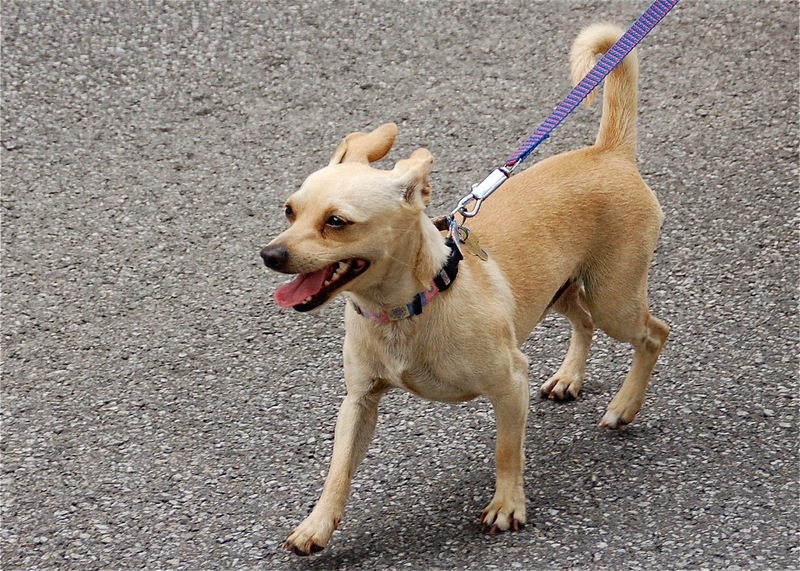 I always feel bad for dogs I see doing the "hot trot" because of hot asphalt. I have actually approached a couple of owners who did not realize it, and were grateful I had done so. Very cool of you. I think it's something that slips a lot of people's minds, so it's nice to have a reminder. Great post! We have really hot summers here in Oklahoma too and the asphalt gets really hot. It's smart not to take the doggies out in the heat of the day! Great tips!!! Thank you for sharing! I can imagine how it must feel on their feet walking on that hot pavement. OUCH! Have a great day! Excellent post, Miss Ann! Since I live in South Florida, now is about the time when we do NOT walk except in the early mornings or late evenings when the ground is cooler. I also have PawZ boots and think they are great! 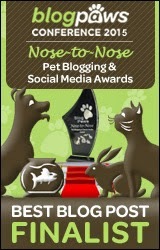 I've never had to use the ointments though the one from Only Natural Pet sounds interesting. Thanks for some great tips to keep our tootsies safe this Summer! It SHOULD be that hot here too Oz. But we had a cold front earlier this week and it was like 50. Really weird for Texas right now. It's starting to warm up again though. Lol, well I'm not sure if I could get Shiner to sit in a stroller too. They do make those buggies you can put onto the back of a bicycle too. We have one but have never tried to put the dog in there. Very nice of your mom to test the streets herself! OMG, I had to laugh at push them in a stroller! Could you imagine Titan in one? bahahahaha Great tips Ann! We haven't had issues with our paws and heat, but then we just hop up on the grass if the pavement is too warm. We have more trouble with being too warm in general. Paws are great, my sisters and I all have some. 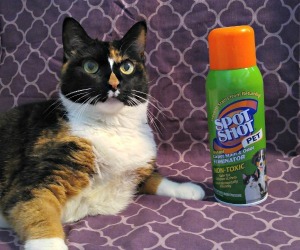 What a good post because it can be so hard on the pets with the hot summer ground. Hot sand is another thing to watch for. While dog owners may want to take their dogs to the lake or beach on a hot day, remember the sand on the way to the water could be quite hot. I'm kind of paranoid about hot pavement as a dog walker. On extra hot days, I keep the dogs on grass or at least concrete (vs. pavement). I also stop for breaks in the shade, and sometimes I'll pour a little water on their paws to help cool them. I have used the Pawz boots on dogs for other reasons, and I think they're great since they're so lightweight. Thanks Lindsay! I'm sure as a dog walker, this is something that is always on your mind. Great tips you have as well! Some really good suggestions for keeping doggie paws cool! We recently ordered some Pawz booties for Alfie, but haven't tried them on yet. I also got him some Musher's secret which I think is quite similar to the other products you mentioned in your post. It's been pretty cool here actually. Quite surprising for Texas this time of year. Thanks for sharing. Do you have any recommendations for dog sunscreen? I've read that it is good to put on their ears, nose and belly. Great reminder as the summer approaches. 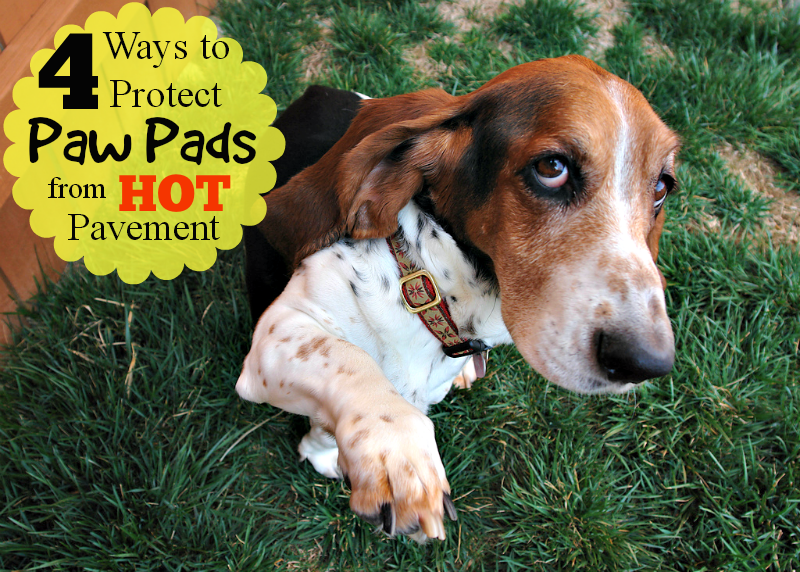 Protect those pads! The idea of Huffle in a stroller is hilarious. He might cooperate, he loooves car rides! But he also sure does love his walks even in the sun, even when he's too hot to go on, he'll head for the asphalt rather than the cooler sidewalk so I have to steer him away. It's a peculiar thing! I've been watching his paws carefully to make sure we're doing ok. I have the same hilarious image of Shiner in a stroller in my head! I disagree with using the balloon boots in the heat. Dogs need to sweat through their paws in order to cool. And if the concrete is too hot then it is too hot to be wearing a rubber balloon that does not circulate air... period. Too many people will overdue it in the heat and the animal is at risk. I use the balloon boots in the winter to keep salt off but only for short times. The rubber is cold and provides no warmth in the winter. Thanks for your input Amy. It is something to consider should someone decide to use such a product. They actually say on the web site not to over use them and that theybshpuld be talen off shen dog is resting or in the air conditioner. I do get your point however. I eoild saybif it's hooter then where your dog just needs some water keep them in the air conditioner. Service sog handlers, however, don't always have this luxery. If i can i try to reschedule or sxhedule in the first place a time where it would be a bit cooler in the summer time. But thats not always possible. I need my dog any where I go but I do want to keep hom sage so we are going to use the pawz boots to keep his feetsies safe from hot pavement. Thankfully we dont have to go too far though! We just walk to the bus and across the pavement to the building... But hot pavement is still hot pavement!! Thanks for your input Lusha. Sometimes, hot surfaces are unavoidable as it seems in your case with your service dog. I agree that it is better to protect your dog's feet rather than allowing them to touch the hot surface.